Iran's president has warned against US-led efforts to pressure it over its nuclear programme - saying the West would suffer if action was taken. 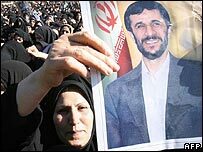 President Mahmoud Ahmadinejad said the West could not force Iran to give up its right to nuclear power through "bullying and brutality". US officials have called for continued international pressure on Iran. The UN nuclear agency has decided to send a report on Iran's nuclear activity to the UN Security Council. "Western countries know that they are not capable of inflicting the slightest blow on the Iranian nation because they need the Iranian nation," Mr Ahmadinejad was quoted as saying in a speech. "They will suffer more and they are vulnerable," he said, without elaborating. Earlier, the US ambassador to the UN, John Bolton, called for continued international pressure on Iran and talked of a sense of urgency given Tehran's defiance of the world community. Russian Foreign Minister Sergei Lavrov said the agency should continue to lead efforts to resolve the dispute. He expressed doubt that sanctions against Tehran would be effective. "I don't think sanctions as a means to solve a crisis have ever achieved a goal in recent history," he told reporters. Western nations have accused Iran of seeking to develop nuclear weapons, while Iran insists its nuclear programme is for civilian energy use only. The Security Council is expected to discuss the issue as early as next week. The council has the power to impose sanctions, but it is not clear that all its key members would back them. Diplomats suggest the Security Council could start the process by putting out a statement calling for Iran to suspend its uranium enrichment activities and asking the UN nuclear watchdog, the IAEA, to report on whether or not it complies. The report being forwarded to the Security Council - which was leaked to the media last week - says the Iranians have begun feeding uranium gas into centrifuges, a first step in a process that can produce fuel for nuclear reactors or bomb material. IAEA head Mohamed ElBaradei said in the report that he was unable to confirm that Iran was not seeking nuclear weapons. He has appealed to both Western and Iranian leaders to "lower the rhetoric". "Everybody is looking forward to a political settlement... What we need now at this stage is a cool-headed approach," he said. Iran declared in January it was resuming uranium enrichment for research purposes, ending a two-year suspension.